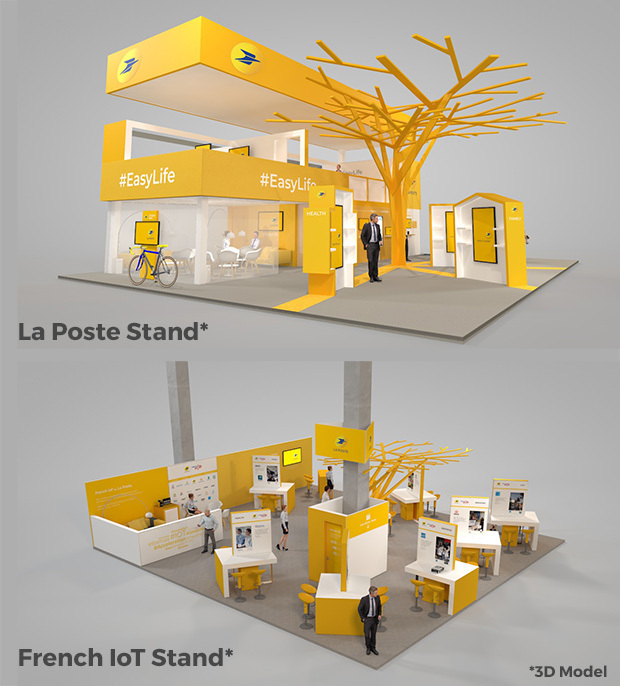 For the fifth year running, Le Groupe La Poste will be at the CES in Las Vegas, from 8 to 11 January 2019. It will present innovations developed by the Group itself, and by the start-ups on its French IoT programme, showcasing the advances it has made in the field of e-health. Through the voice of its female Executive Vice President, it will also reassert its commitment to gender parity in the digital sector. As in previous years, La Poste will occupy two different locations at the show. At its stand in the main area of the CES, six mail carriers and two post office customer service representatives will present the innovations developed by La Poste and its subsidiaries. Meanwhile, at its stand in Eureka Park, 17 start-ups including the 15 winners of the La Poste’s 2018 French IoT will be showcasing their innovations. Five years ago, La Poste went to CES to present digital innovations that were primarily designed to simplify and/or build on the work of mail carriers: dedicated apps installed on the mail carrier’s smartphone to track parcels or obtain the customer’s signature, parcel shipping from home, the Watch Over My Parents social monitoring service, and more. This year, now firmly established as a recognised, committed player in France’s digital sector, La Poste is unveiling ten or so products developed for the general public. These will be exhibited within four themes which marry local service with digital technology: “Health”, “Family”, “Young Adult”, and “Work”. Together with the other innovations presented on the stand, like those gathered under the theme "City", which is primarily intended for local authorities, no fewer than 17 solutions will be on display! Five years on from its first CES, La Poste has confirmed beyond doubt its position in France’s digital ecosystem, partly thanks to its French IoT programme, which currently brings together more than 200 start-ups, and above all through its own development activities, particularly in e-health. The Group positioned itself in this field last year, at the 2018 CES, with the launch of the La Poste eHealth app. Over the past year, La Poste has defined a development pathway in this field, with partner companies and start-ups linked to it. Representatives of the Group speaking at the show will focus strongly on this, and will also address the issue of gender parity in the digital sector, a topic that demands urgent consideration at a time when French companies are unable to fulfil their requirements in terms of digital skills. La Poste used the 2018 CES to announce the launch of La Poste eHealth, a free “health monitoring” app which enables any individual to measure and track their physiological data (weight, heart rate, blood sugar, etc. ), either through manual entry or by linking to connected objects. Based on the measurements recorded, the user can then obtain generic advice from the app, or share their data with their doctor as part of their therapeutic monitoring, and quickly ascertain their opinion. In the course of 2018, a number of partnerships were established with healthcare institutions. The Bichat hospital, the Elsan network of private clinics, the Arrow pharmaceutical laboratory, the Rafael post-cancer institute, the Strasbourg IHU (university hospital), and the Cerba Healthcare network of medical analysis laboratories have all perceived the benefits of the digital ecosystem developed by Docaposte, one of La Poste’s subsidiaries specialising in digitisation and electronic archiving, and France’s leading health data host . This ecosystem enables them to interconnect their own information systems very easily to Docaposte’s ultra-secure digital platform, in order to exchange information with their patients via a mobile app such as La Poste eHealth. There are many advantages: faster administrative procedures, shorter hospital stays (thanks to remote monitoring), more secure healthcare pathways (improved information sharing with the patient and their other therapists), personalised medical follow-up, and more. Practitioners and patients alike benefit greatly from all these improvements in the healthcare pathway (more information here). In positioning itself in the e-health sector, La Poste continues in its historic role as a trusted intermediary, and remains true to its promise to make life easier for all French people. The fact is that gender parity is not taking effect equally quickly in every line of work. While the proportion of women in medicine has grown considerably in the past 30 years, it has halved in the IT sector. Is this a question of social expectations? Very probably. The kind of social expectations that encourage men to make their careers in the IT sector and discourage women from doing the same. How can we allow women to be shut out of this sector which currently offers such excellent employment and career prospects, and will do so for a long time to come? How can we accept women not being key players in the developments, largely digital in nature, that will bring about profound change in our society: artificial intelligence, smart cities, e-health, smart homes, management of citizen relations, etc. It’s a question of education. We have to put an end to the very male image of the geek. From primary school onwards, girls, boys, women and men must understand that careers in the digital sector are equally open to them all. It’s not simply a question of values, but of economic necessity: companies’ requirements in terms of digital skills are not being met by the 67% of men and 33% of women currently working in the IT sector! Mobilisation is under way. Thirty organisations have come together to form the Femmes@Numérique group, to promote parity in all sectors of the economy, and more specifically in the areas of technology, the sciences and digital technology. Their actions will be partly financed by the 42 companies that have joined the Femmes@Numérique foundation, including La Poste. Within the Group, whose fight for gender parity goes back a long way, Nathalie Collin, Le Groupe La Poste’s Executive Vice President responsible for digital technologies and for communication, is spearheading the conviction that the digital sector cannot happen without women. She has already expressed her views on the topic in La Tribune and Madame Figaro, and will do so again at the show at 5.00 pm on Tuesday 8 January, at the inaugural “Meeting of Women in Digital", where she will also launch the call for votes for the operation conducted with KissKissBankBank. Docaposte already hosts, entirely securely and confidentially, tens of millions of health records (pharmaceutical files, beneficiary files, insurance files, etc.). An information meeting for Vosges elected officials and decision makers.